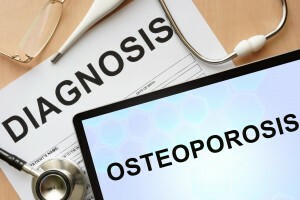 Osteoporosis is a condition which is quite clearly defined by its set of symptoms but there are a range of other, rarer, conditions which are related and have similar symptoms and may come up during your diagnosis process. It is important to understand the differences and key symptoms of some of these other conditions so you are aware if you experience changes in your bones and joints. Almost all of these conditions have their own diagnosis and treatment pathways and can be managed by the right treatment sought as soon as possible. Unusual and only found rarely, osteoporosis in children usually manifests as idiopathic juvenile osteoporosis. The condition is classified as when broken bones seem to occur of their own accord with seemingly no underlying issues. Sometimes the osteoporosis occurs because of an issue which can be found such as corticosteroid use, due to the child being immobile or due to osteogenesis imperfecta being diagnosed. In cases where there is no definable underlying cause children are diagnosed with idiopathic juvenile osteoporosis. This rare variation of osteoporosis can cause acute chronic pain and usually occurs alongside sudden loss of bone density. It tends to occur in a specific area, most commonly the hip and it is unlike the classic symptoms of the most common type of osteoporosis, where pain is only felt when broken bones occur. Transient Migratory Osteoporosis has a symptom of regular, sometimes constant, pain which can migrate around the body and referral to a pain clinic is often necessary to manage the acute pain associated with this condition. Complex regional pain syndrome usually affects a hand, foot, knee, wrist or ankle but it can spread to effect an entire limb. The condition is often triggered by a minor injury such as a small fracture but the reason for the constant and continual pain is not something even doctors understand. Sometimes a nerve injury can be found to be the actual root cause of the syndrome but this is not always the case and as a rule the localised problem does not tend to result in general osteoporosis. CRPS requires specialist treatment, usually through a pain clinic referral. Osteoarthritis differs from osteoporosis because it is a disease that specifically affects the joints of the body and causes them to become inflamed and damaged. Almost any joint in the body can be affected from knees and knuckles to hips and joints within the spine. Like osteoporosis, osteoarthritis occurs most commonly as people begin to age and sometimes issues such as back pain are found to be due to osteoarthritis in the joints, which can then begin to be treated effectively. If you have any questions about Osteoporosis and other related bone conditions or would like to book an appointment with Dr Stephanie Barrett then please get in touch here.